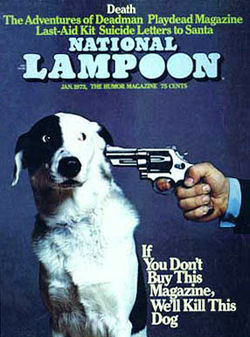 If you don't buy this magazine, we'll kill this dog," said National Lampoon. I thought of that cover when I picked up this morning's paper. One by one they appear: the halt, the sick, the lame, and all with the same sad tale: "the Government has cut off our money." You need money for therapists to treat your special needs children? Sorry we're all out of it. You need help to get a qualification and move off the benefit? Sorry: we're strapped. The implicit proposition in any of these cuts is: "we really don't want to do this, but we have no alternative." But this is not true. It would be better expressed as: "we have no political alternative." There were tax cuts by the last government last year, there were tax cuts in April this year. In the end, there were only a lonely few of us arguing against them, and there probably would be few people who would argue now to have them unwound, and certainly not Bill English. The Minister of Finance talks about the Decade of Deficits, but he doesn't mention one of the reasonably enormous contributing factors. He was frankly regretful in this year's budget about cancelling the tax cuts still to come, but he left entirely unanswered the logical next question: what about the ones we've already had? Those tax cuts his party spent five years clamouring for constitute a lot of red ink. They add up to $3.3 billion dollars of revenue per year the government has foregone. It's not entirely red ink; there's a stimulus contribution you have to factor in. Nonetheless: each time we read a front page story about the $2.5 million the government can no longer afford, let's bear in mind the $3.3 billion that could have covered it.